Callum Harriott struck his first two league goals of the season to help ensure a win that sealed Charlton's Championship survival. The winger, 20, gave his side a half-time lead with an angled drive from just outside the penalty area. Troy Deeney equalised for Watford with a 25-yard volley, but captain Johnnie Jackson restored Charlton's lead. Harriott scored again with a left-footed volley, before Hornets winger Albert Riera was sent off. Former Spain international Riera, who spent two seasons with Liverpool, had already been booked when he was dismissed for a foul on Lawrie Wilson. 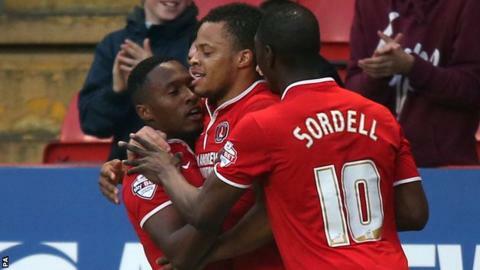 Victory means Charlton are five points clear of the relegation zone with one match to play. Owner Roland Duchatelet sacked manager Chris Powell in March and replaced him with Jose Riga, who agreed a contract until the end of the season. Belgian coach Riga, the former technical director of AC Milan's academy, has earned six wins from his 14 matches in charge to lift the Addicks off the bottom of the Championship and away from trouble. Harriott had fired over an early chance from eight yards before he opened the scoring in the 22nd minute, gathering a pass from Jordan Cousins out on the left before hitting a 20-yard drive across keeper Jonathan Bond and into the far corner. A patched-up Watford side, struggling with injuries and suspension, drew level after the break when Deeney smashed in his 24th goal of the season with a spectacular volley. But 10 minutes later Charlton were back in front when Jackson took Morgan Fox's left-wing cross on his chest - and although the midfielder's initial effort was blocked by Bond, he managed to nudge in the rebound. Seven minutes later, Harriott volleyed in his second goal to condemn mid-table Watford to a third straight defeat, with Riera's red card adding to the visitors' frustration. "Let me enjoy the present before thinking about it. The future I have to discuss, I don't know when. "If you ask me if I enjoy the competition, the club, the fans, then yes. I like England. We have a good foundation here and I think Charlton has a very good future. "But I know about football, it depends on the situation. It's not a problem. I've done my job and it's enough to be really happy." "I'm not happy, so on Wednesday all the squad will be at the training ground because we are professional. "We have to work hard to prepare for Saturday. "The players' contracts run until the end of June so we will keep working after Saturday. We need to build a team for next season with a different DNA." Match ends, Charlton Athletic 3, Watford 1. Second Half ends, Charlton Athletic 3, Watford 1. Jonathan Obika (Charlton Athletic) wins a free kick in the attacking half. Attempt saved. Ikechi Anya (Watford) right footed shot from outside the box is saved in the bottom left corner. Assisted by Troy Deeney. Andy Hughes (Charlton Athletic) is shown the yellow card for a bad foul. Samba Diakité (Watford) wins a free kick in the defensive half. Foul by Andy Hughes (Charlton Athletic). Hand ball by Ikechi Anya (Watford). Substitution, Charlton Athletic. Andy Hughes replaces Chris Solly. Michael Morrison (Charlton Athletic) wins a free kick in the defensive half. Substitution, Charlton Athletic. Joe Pigott replaces Callum Harriott. Attempt missed. Morgan Fox (Charlton Athletic) left footed shot from the left side of the box misses to the right. Mathias Ranégie (Watford) is shown the yellow card for a bad foul. Diego Poyet (Charlton Athletic) wins a free kick on the right wing. Offside, Charlton Athletic. Dorian Dervite tries a through ball, but Jordan Cousins is caught offside. Second yellow card to Albert Riera (Watford) for dangerous play. Dangerous play by Albert Riera (Watford). Attempt blocked. Samba Diakité (Watford) right footed shot from the centre of the box is blocked. Assisted by Mathias Ranégie. Goal! Charlton Athletic 3, Watford 1. Callum Harriott (Charlton Athletic) left footed shot from the centre of the box to the bottom right corner. Assisted by Lawrie Wilson with a cross. Substitution, Watford. Samba Diakité replaces Sean Murray. Attempt missed. Jonathan Obika (Charlton Athletic) left footed shot from outside the box misses to the left. Assisted by Lawrie Wilson. Attempt blocked. Callum Harriott (Charlton Athletic) left footed shot from outside the box is blocked. Assisted by Lawrie Wilson. Attempt missed. Ikechi Anya (Watford) right footed shot from outside the box misses to the left. Goal! Charlton Athletic 2, Watford 1. Johnnie Jackson (Charlton Athletic) left footed shot from the centre of the box to the bottom right corner. Assisted by Morgan Fox with a cross. Attempt missed. Troy Deeney (Watford) right footed shot from the right side of the box is too high. Assisted by Ikechi Anya. Substitution, Charlton Athletic. Jonathan Obika replaces Marvin Sordell. Foul by Essaïd Belkalem (Watford). Jordan Cousins (Charlton Athletic) wins a free kick in the attacking half. Attempt missed. Marvin Sordell (Charlton Athletic) right footed shot from the centre of the box is close, but misses to the right. Assisted by Johnnie Jackson with a cross following a set piece situation. Albert Riera (Watford) is shown the yellow card. Foul by Albert Riera (Watford). Corner, Watford. Conceded by Callum Harriott. Gabriele Angella (Watford) wins a free kick in the defensive half.